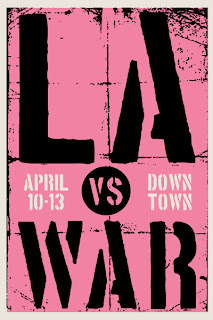 Graffiti and Stencil Garden section of the historic "LA VS WAR"
event taking place April 10-13th, 2008. Thursday, April 10, 2008: 12:00 p.m. - 11:00 p.m.
Friday, April 11, 2008: 12:00 p.m. - 11:00 p.m.
Saturday, April 12, 2008: 12:00 p.m. - 11:00 p.m.
Sunday, April 13, 2008: 12:00 p.m. - 11:00 p.m.
YO presents 4 days of Art and Activism Against the War. 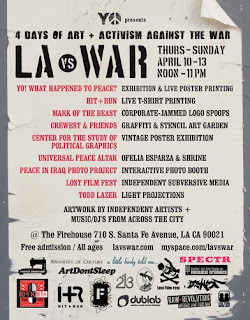 LA vs WAR highlights the travesty of a senseless war now going into its 6th year, giving LA artists a platform to exercise their freedom of speech. Hundreds of artists representing our diverse communities unite in delivering a universal message of peace and understanding, and offering resistance and opposition to the US government's war policies. All ages are welcome and admission is free.